I love to "fool around" in the kitchen and by that I mean spending an entire afternoon alone in the kitchen with an ingredient. Some of delicious creations have come out of these "fooling around" sessions. 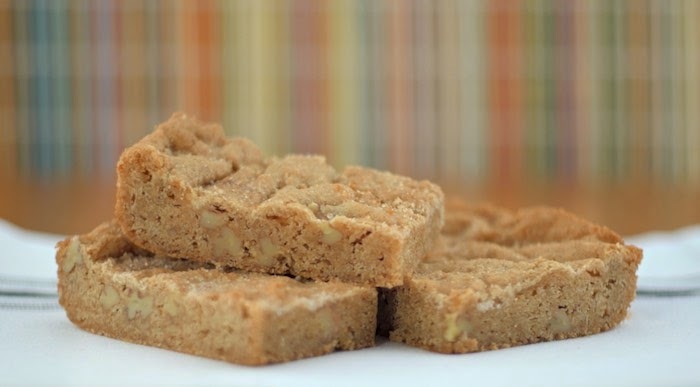 Take for example these Pecan Snickerdoodle Blondies, they are the result of an afternoon of "fooling around" in the kitchen with a bag of pecans! Mind you they were no ordinary Pecans rather they were Georgia Pecans from Pearson Farms. Having been in the pecan business for 100 years, you can imagine how fine Pearson Farms' rawpecans must taste. They make a deliciously wholesome snack eaten by the handful and are equally delicious added to baked goods, which brings us back to my Pecan Snickerdoodle Blondies. Each bite mixes the flavors of cinnamon, nutmeg and pecan followed by the sweetness of the vanilla sugar. They are irresistible...but don't go by what I say, try them for yourself. Preheat oven to 350 degrees. Grease a 9×9 pan. Combine the flour, baking powder, cinnamon, nutmeg, and salt in a bowl. Set aside. In a bowl of a stand mixer, beat together the butter and brown sugar for 3-5 minutes. Add in the eggs one at a time, along with the vanilla extract. Beat until smooth. Fold in the flour mixture and chopped pecans until just combined. Spread evenly into the prepared pan. Combine the vanilla sugar and cinnamon in a small bowl and sprinkle evenly over the top of the batter. Bake 25-30 minutes or until golden brown. Cool before cutting. Oh, I am all over these! I LOVE snickerdoodles! They look so yummy! Playing around in the kitchen is always such a luxury that I enjoy. It looks as though your playtime was well rewarded with these amazing bars! Hello good looking. It's time to get in my belly. I adore Snickerdoodles and have never made them in bar form - great idea! I love playing in the kitchen, too! It's a stress reliever for me. Delicious looking blondies! These sound really good. I love the addition on pecans. I love the sound of pecans in these bars. These sound fantastic, I love snickerdoodles and blondies and pecans, so the rest goes without saying. I *love* snickerdoodles! What a great idea to turn them into bars! Pecans are my favorite to add to recipes! These look amazing! Georgia Pecans are the best aren't they! Love the bars! I always tell people I play with my food for a living. It never gets old. I love those playing in the kitchen sessions. So much fun. I am totally in love with pecans and these snickerdoodle blondies. Georgia pecans are the best. These blondies look amazing! LOVE all that peanut butter flavor..yum! Yum, I love blondies, this combination sounds wonderful! Oh wow what a cool idea! I'm glad you're taking this time to fool around in the kitchen... these blondies look delicious! Love this idea. Pecans are my favorite nut. Just love them in a blondie! These are fantastic. I haven't made blondes in years, but it might be time to change that.